The productive activities that constitute our material existence create the possibility of culture. Morality, custom, law, science and religion have an economic base and can be largely explained in terms of features of the base. Further, no economic system exists without an ecological foundation: the productive activities that constitute our material existence in turn depend upon an environmental matrix. Economic activity is a social function, thus political life and economic life are intertwined to form a political economy. Two alternative forms of industrial political economy are possible, conforming to two different models: (1) the Expansionary Model and (2) the Stationary-State Model. Because it requires perpetual growth, the Expansionary Model inherently contradicts the practical finitude of nature, and so does violence to nature, thereby also producing social injustice, especially to future generations of citizens. By contrast, the Stationary-State Model recognizes the practical finitude of nature and respects the value of the whole and its parts. 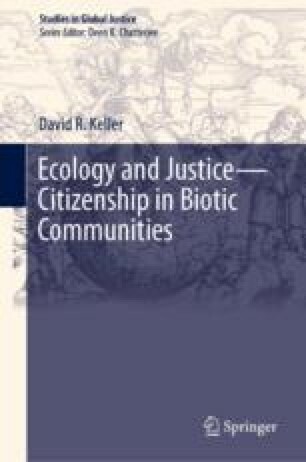 This model maintains the functional integrity of biotic systems by respecting the fact that the economy is inescapably rooted in ecological reality and by recognizing the full array of values—both economic and non-economic—that are present. Further, it can accommodate a form of “no-diseconomy capitalism,” in which public policy prevents the acquisition of profit by externalizing the costs of production—costs that would be unjustly borne by the least wealthy and powerful citizens. Therefore, it is the only model that can support a healthy biosphere and social justice. Blair, Kathleen. 1995. Cryptosporidium and Public Health. Drinking Water & Health Newsletter (March 1). http://waterandhealth.org/newsletter/old/03-01-1995.html. Accessed 21 Aug 2011.